Fishers’ local knowledge and their perceptions of climate change are increasingly recognized by researchers and international institutions. However, in India, limited regional studies are available to understand the fishers’ local knowledge, and a crucial question which largely remained unaddressed has been how fishers perceive the relevance of their local knowledge systems in the face of climate change. Provided this background, this paper aims to explore the fishermen’s local knowledge and their climate perceptions in the face of climate change. This paper has employed the data that were obtained by in-depth interviews and focus-group discussions with the small-scale fishermen of three highly vulnerable fishing villages of Nagapattinam district, Tamil Nadu. The marine fishers across this coast were the victims of the 2004 Indian Ocean Tsunami disaster, several major cyclones, and various weather and climate events for over the last four decades. Key results show (1) fishermen perceive multiple aberrations and anomalies in the weather and climate patterns for over the previous three to four decades, particularly after the 2004 Indian Ocean Tsunami disaster. (2) The next finding is contrary to the conventional understandings, in which we have found that the fishermen are increasingly felt and experienced that their local knowledge is no longer adequately relevant in the face of climate change. 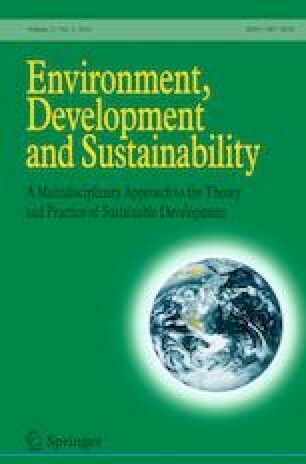 Thus, for promoting the adaptive capacity of fishers, this paper has suggested that fishermen’s perceptions and their expectations should be appropriately recognized and there is a strong need to provide scientific assistance to the fishermen through proper channels to respond to climate change impacts. The authors thank the anonymous reviewers for their constructive comments and suggestions to improve the final version of the paper. Bhalla, R. S., Ram, S., & Srinivas, V. (Eds). (2008). Studies on vulnerability and habitat restoration along the Coromandel Coast. UNDP/UNTRS & FERAL, Pondicherry, India. Accessed 20 January 2016 from https://researchonline.jcu.edu.au/18361/1/Srinivas_2008.pdf. Byravan, S., Chella Rajan, S., & Rangarajan, R. (2010). Sea level rise: Impact on major infrastructure, ecosystmes and land along the Tamil Nadu Coast. Centre for Development Finance, IFMR Research & IIT Madras. Accessed 18 June 2015 from https://www.preventionweb.net/files/16858_reportonsealevelriseandimpactoncoas.pdf. CCC&AR, & TNSCCC. (2015). Climate change projection (rainfall) for Nagapattinam. In: District-wise climate change information for the state of Tamil Nadu. Centre for Climate Change and Adaptation Research (CCC&AR), Anna University and Tamil Nadu State Climate Change Cell (TNSCCC), Department of Environment (DoE), Government of Tamil Nadu, Chennai, Tamil Nadu, India. Accessed 12 July 2017 from http://www.tnenvis.nic.in/WriteReadData/UserFiles/file/15_NAGAPATTINAM_RAINFALL.pdf. CMFRI. (2012). Marine Fisheries Census 2010 Part II. 4 Tamil Nadu. New Delhi: Government of India, Ministry of Agriculture, Department of Animal Husbandry, Dairying and Fisheries and Central Marine Fisheries Research Institute, Indian Council of Agricultural Research. Accessed 15 July 2016 from http://eprints.cmfri.org.in/9002/1/TN_report_full.pdf. CSTEP. (2014). Climate change vulnerability and adaptation in South Asia project report. Bangalore. Accessed 20 June 2017 from http://www.cstep.in/uploads/default/files/publications/stuff/CSTEP_Climate_Change_Vulnerability_and_Adaptation_in_South_Asia_Report_2014.pdf. FAO. (2005). Impacts of the Tsunami on fisheries, aquaculture and coastal livelihoods—Update on the situation of the affected areas. Accessed 20 December 2017 from http://www.fao.org/fishery/docs/DOCUMENT/tsunamis_05/jan_07_2005/tsunami_7_1_05.pdf. Government of Tamil Nadu. (2014). Coastal districts profile of Tamil Nadu. ENVIS Centre, Department of Environment Government of Tamil Nadu. Accessed 14 August 2015 from http://tnenvis.nic.in/tnenvis_old/Coastal%20district%20profile.pdf. Government of Tamil Nadu. (2018). Fisheries department—Policy note, 2017–2018. Accessed 3 March 2018 from http://cms.tn.gov.in/sites/default/files/documents/fisheries_e_pn_2017_18.pdf. Government of Tamil Nadu. (n.d). Tsunami relief in the state of Tamil Nadu—India (Focus on Nagapattinam experience). Accessed 19 May 2016 from http://www.tn.gov.in/tsunami/digitallibrary/ebooks-web/37%20Focus_on_NGT_tsunam_%20relief.pdf. INCOIS. (2014). Impact of INCOIS scientific forecast services towards improving the lives and livelihoods of fishing communities across Tamil Nadu and Puducherry. Accessed 10 March 2017 from http://www.incois.gov.in/documents/scientificForecastServices.pdf. International Council for Science. (2002). ICSU Series on science for sustainable development no. 4: Science. Traditional Knowledge and sustainable development. Accessed 10 January 2018 from https://unesdoc.unesco.org/ark:/48223/pf0000150501. Kelman, I., Mercer, J., & West, J. J. (2009). Combining different knowledges: Community-based climate change adaptation in small island developing states, participatory learning and action notes (PLA 60). Accessed 16 October 2017 from http://pubs.iied.org/pdfs/G02812.pdf. Kurien, J. (1996). Towards a new agenda for sustainable small-scale fisheries development. South Indian Federation of Fishermen Societies, Kerala. Accessed 23 September 2016 from http://dlc.dlib.indiana.edu/dlc/bitstream/handle/10535/5118/Towards%20a%20new%20agenda%20for%20sustainable%20small%20scale%20fisheries.pdf?sequence=1. Kurien, J. (1998). Small-scale fisheries in the context of globalisation. Centre for development studies working paper, No. 289, Kerala. Accessed 10 March 2016 from https://opendocs.ids.ac.uk/opendocs/bitstream/handle/123456789/2937/wp289.pdf?sequence=1&isAllowed=y. Lakshmi, A. (2011). Review of literature for ICSF study on ‘Climate Change and fisheries: Perspectives from small-scale fishing communities in India on Measures to Protect Life and Livelihood. International Collective in Support of Fishworkers. Accessed 12 Jan 2016 from http://aquaticcommons.org/11236/1/_1297744872338_ICSF%20Study%20on%20Climate%20Change.pdf. Madhanagopal, D. (2018). Insecure lives under extreme climate conditions: Insights from a fishing Hamlet in Tamil Nadu, India. Metropolitics. Accessed 18 April from https://www.metropolitiques.eu/IMG/pdf/met-madhanagopal.pdf. Murugan, A., & Durgekar, R. (2008). Beyond the Tsunami: Status of fisheries in Tamil Nadu, India: a snapshot of present and long-term trends. UNDP/UNTRS, Chennai and ATREE, Bangalore, India. Accessed 06 January 2018 from https://www.dakshin.org/wp-content/uploads/2013/04/FISHERIES-REPORT.pdf. Nakashima, D., & Roue, M. (2002). Indigenous knowledge, peoples and sustainable practice. In P. Timmerman (Ed. ), Encyclopedia of global environmental change, Chichester: Wiley (pp. 314–324). Accessed 14 April 2015 from http://www.unesco.org/new/fileadmin/MULTIMEDIA/HQ/SC/pdf/sc_LINKS-art%20EGEC.pdf. National Remote Sensing Center (ISRO, Government of India). Bhuvan, Indian Geo Platform of ISRO. Hyderabad: India. https://bhuvan.nrsc.gov.in/bhuvan_links.php. NCAER. (2010). Impact Assessment and economic benefits of weather and marine services. New Delhi: National Council of Applied Economic Research. Accessed 13 June 2017 from http://www.incois.gov.in/documents/ImpactAssessment-NCAER2010.pdf. Panipalla, R., & Marirajan, T. (2014). Participatory study of the traditional knowledge of fishing communities in the Gulf of Mannar, India (Report). Chennai: ICSF. Accessed 23 November 2017 from http://aquaticcommons.org/16974/1/A%20participatoru%20Study%20of%20the%20TK_2014.pdf. Patnaik, U., & Narayanan, K. (2009). Vulnerability and climate change: an analysis of the eastern coastal districts of India. MPRA Paper, No. 22062. Accessed 12 October 2014 from https://mpra.ub.uni-muenchen.de/22062/1/MPRA_paper_22062.pdf. Salagrama, V. (2012). Climate change and fisheries: Perspectives from small-scale fishing communities in India on measures to protect life and livelihood. Chennai: International Collective in Support of Fishworkers. Accessed 12 March 2016 from http://aquaticcommons.org/11190/1/Climate_Change_Full.pdf. Suyasaaradha, S. (2005). Puducherry vattara meenavargalin thozhil aaar arivugal. Unpublished Ph.D. thesis. Pudhucherry University, Pudhucherry, India. Accessed 04 February 2017 from Shodhganga database: http://shodhganga.inflibnet.ac.in/handle/10603/5866 (in Tamil). Swathi Lekshmi, P. S., Dineshbabu, A. P., Purushottama, G. B., Thomas, S., Sasikumar, G., Rohit, P., Vivekanandan, E., & Zacharia, P. U. (2013). Indigenous Technical Knowledge (ITKs’) of Indian Marine fishermen with reference to climate change. Central Marine Fisheries Research Institute, Kochi. Accessed 16 Jan 2017 from http://eprints.cmfri.org.in/9455/1/Indigenous_Technical_Knowledge_(ITKs%E2%80%99)_of.pdf. TNSAPCC. (2013). Tamil Nadu state action plan on climate change. Government of Tamil Nadu. Accessed 14 September 2017 from http://www.indiaenvironmentportal.org.in/files/file/tamil%20nadu%20climate%20change%20action%20plan.pdf. Vivekanandan, E. (2011). Marine fisheries policy brief-3; climate change and Indian marine fisheries. CMFRI Special Publication (Vol. 105, pp. 1–97). Accessed 10 September 2017 from http://eprints.cmfri.org.in/8440/1/CMFRI_SP_105.pdf. Zacharia, P. U., Dineshbabu, A. P., Thomas, S., Kizhakudan, S. J., Vivekanandan, E., Lakshmi Pillai, S., Sivadas, M., Ghosh, S., Ganga, U., Rajesh, K. M., Nair, R. J., Najmudeen, T. M., Koya, M., Chellappan, A., Dash, G., Divipala, I., Akhilesh, K. V., Muktha, M., & Dash, S. S. (2016). Relative vulnerability assessment of Indian marine fishes to climate change using impact and adaptation attributes. CMFRI Special Publication No. 125, (CMFRI-NICRA Publication No. 5), Kochi: CMFRI. Accessed 22 August 2017 from http://www.nicra-icar.in/nicrarevised/images/publications/Tbu_Relative%20vulnerability%20assessment%20of%20Indian%20marine%20fishes.pdf.